The heart is fragile. Not just in love, but in life. Today one in four people die from heart disease. It remains the number one killer of both men and women. The Wheeler Heart and Vascular Center provides outstanding care, but often our patients need a little more. 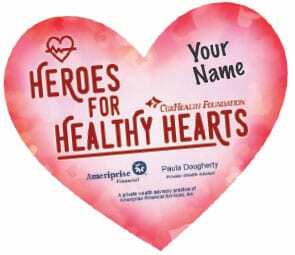 Are you ready to be a Hero for Healthy Hearts? 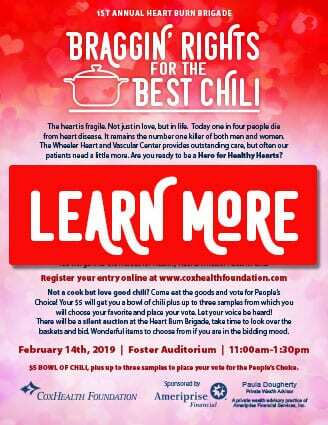 In the month of February you can join us as we raise funds to stay right here in the Ozarks, providing for our local patients. Be a hero to someone who needs a hand up in recovering from or working through cardiac disease. Whatever the need, your efforts can help put these patients back on the road to good health. Note! Final collection day to be considered for prizes will be Thursday, February 28th, 5:00pm. Anyone can be a hero and support this effort! Even if you do not want to join the competition, anyone can purchase a heroes heart below. And each and every one of you will be appreciated beyond measure. You are lifting up those in need. Heart sales are no longer available.